"Very good theater. Some real thought and emotional spadework has been put into the leading roles. Long plays Maria with an earthy, slightly tomboyish feistiness. This is a different character than we know from the movie -- and all the more interesting for her differentness." "As Maria in The Sound of Music, Norah Long has made us forget all about Julie Andrews." "Norah Long is a peerless Maria. Her song renditions are flowing and flawless. 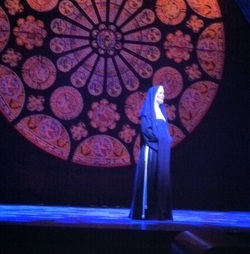 Norah again performed The Sound of Music in 2012 under the direction of James Brennan and Tom Helm at Paper Mill Playhouse, singing the role of the Celebrant and understudying both Mother Abbess (performed by Suzanne Ishee) and Elsa (performed by Donna English) .